This video report on China’s new interest in Middle East diplomacy begins by pointing out that the Obama administration has announced a pivot toward Asia (i.e. US interests lie more in the Pacific Rim than the Middle East.). At the same time, China (which dislikes this pivot, fearing it is aimed against Beijing) is moving into Middle East diplomacy. The young, cosmopolitan new president, Xi Jinping, is separately hosting Israeli prime minister Binyamin Netanyahu and Palestine President Mahmoud Abbas. The USG Open Source Center translates commentary from the Chinese Communist Party’s ‘People’s Daily’, making clear that the Chinese Communist Party is increasingly interested in playing the role of a Great Power in world affairs. This step is a change from the policy of ‘harmonious development, which implied avoidance of such entanglements while. concentrating on growing the economy. With the development and growth of the comprehensive national strength, China will participate in the international affairs and strive to play well its constructive role in an even more active way. 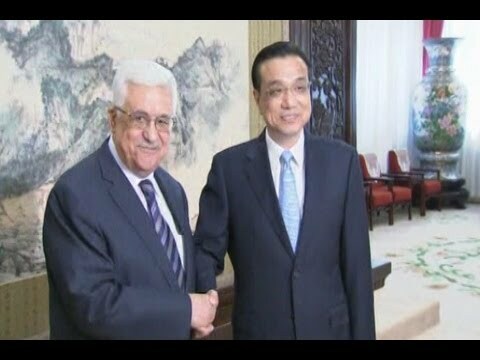 President Abbas of Palestine begins his state visit to China from 5 May. Israeli Prime Minister Netanyahu will also begin his official visit to China from 6 May. China maintains friendly exchanges with both Palestine and Israel, always supports the Middle East peace process, and supports Palestine and Israel to resolve differences and disputes through peace talks. The Chinese side’s invitation of the visits of the two countries’ leaders is also a part of the aforementioned efforts. BOTh Palestine and Israel have expectations for the “China role” on the Middle East issue. The international community also pays high attention to it. Such attention includes concerns on Palestine-Israel relations and on the situation in the Middle East, which also realizes the strong hope for observing and grasping the direction of China’s diplomacy. On the eve of the visits of Palestine’s and Israel’s leaders to China, some individuals suddenly indulged in fantasy and stated as follows: China wants to secure its own “foothold” in the Middle East, and tries to erode the influence of a certain big power in that region. The international arena is not the sole preserve of any one. Pushing for the resolution of the hot-button issues is the common responsibility of all. Turf war and scrambling for interests are totally unrelated. The parties concerned know best in their heart where the source of the aforementioned view lies. The positive move made by China on the Palestine-Israel issue is a natural extension of its independent foreign policy of peace. China does not want to take over the roles of other major powers and of international organizations like the United Nations; it also has not the intention to act like an “umpire.” China supports all proposals that help to promote peace talks between Palestine and Israel, and will, as always, contribute its efforts to promote achieving real results in peace talks. As a responsible power, China defends the purpose and principle of the “UN Charter,” stresses fairness and justice, helps maintain obligations and norms in international relations, and strenuously promote the resolution of differences and disputes through peace talks. This is also China’s basic position on the Middle East issue. One of the major reasons that many regional hot-button issues are not resolved at an early date lies in the failure to fully abide by the aforementioned principles. The line of thinking for resolving problems will open even wider, the opportunities for restarting peace talks will be even more, and the possibility of achieving a breakthrough will increase if we tilt a bit more to the side of these principles. Persisting in these principles means building and mending the platform for peace. The purpose of China’s diplomacy is to build more and mend more platforms, and help create more opportunities for resolving problems and for realizing peace. China is strongly convinced that no matter how complicated various hot-button issues are, as long as one can grasp the major direction, various conflicting parties will be moved to advance in the same direction and a peaceful resolution plan can finally be found. Peace is like air and sunshine. You are not aware of them when you are benefitted from them. But when you lose them, you can hardly survive. If there is no peace, we cannot talk about development. The Chinese people have deep-seated memory of the distress brought about by wars and turmoil, and pursue peace tirelessly. Such a memory and pursuit is the special nature of the Chinese culture, and the spiritual temperament of the Chinese diplomacy. Develop oneself through striving for a peaceful international environment and maintain and promote world peace through one’s own development are complementary and are inseparable. With the development and growth of the comprehensive national strength, China will take part in the international affairs in an even more active way, strive to play well its constructive role, and inject a strong positive energy to promote an early resolution of the Palestine-Israel issue and of other international and regional hot-button issues.